Before the memory fades I must tell you about Sitges (with a see not an it) a small ex fishing village just south of Barcelona. A London friend recommended it and the hotel to stay at, so being in rather fast track mode I called, spoke to the Eve lady and all was booked, easy. We dumped the rentacar at the airport and took the Monbus down the coast accompanied by hoards of fellow revellers, all men. You see Sitges has a certain reputation, if you get my drift, in fact, out with it, it’s the Gay Capital of Europe. This of course is a very good thing, it keeps the worst elements of drunken Northern Europeans out, period. Hooray hooray. The sister had a pleasant room at the front with a tiny balcony while I enjoyed a larger room at the back with a sitting room and almost a deck, oh, and the hotel’s a/c equipment. Up early the next morning, about five, I was wandering the street side restaurant when I was “good morninged” in American by two guys, I responded in like fashion and we chatted along until they saw through my charade, I was invited to join them and we had breakfast every morning for the rest of the stay. Hi Gary, hi Jack and Bill from Fort Myers Florida. Such gentlemen, we had lots of laughs, even over breakfasts. Holiday stupor kicked in, beach, lunch, beach, siesta, beach, wine o’clock, walk the town, dinner, sleep, no complaints, yet. Leaving the beach late one afternoon we saw evidence of the impending mayhem, a stage twixt hotel and sand some twenty five feet from sister’s balcony with the most enormous speaker stack being prepared. This bodes badly thought we, and bad it got. 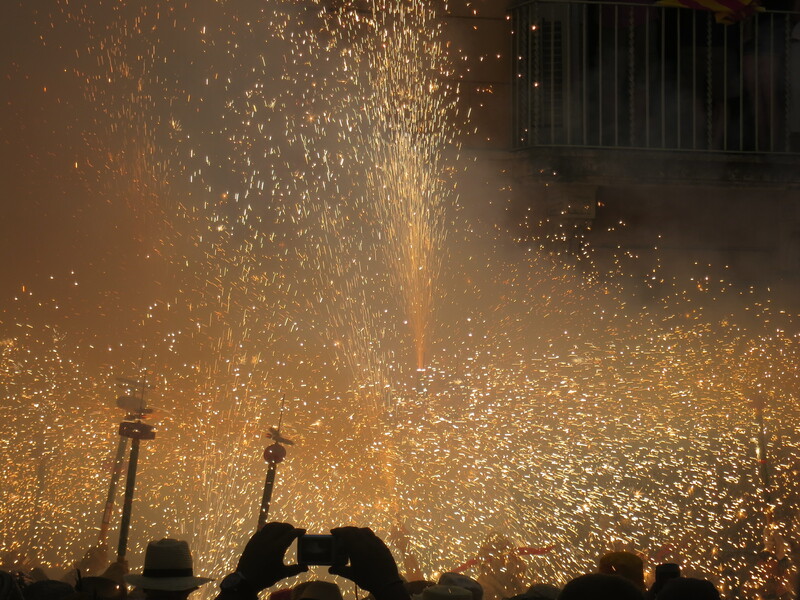 This was the kickoff concert for Festa Major or FM12, or the town’s big annual Fiesta. Starting at about eleven thirty the sister was thrown about her room by the pounding sound waves of electronic dance music (EDM), not a tune could she discern, not a word could she understand, not a beat she could follow, not a wink of sleep could she achieve until five am. I didn’t hear a thing! “You’ve seen nothing yet” we were advised over breakfast the next morning, sister’s crest fell a bit. Undeterred we continued our strolls around town until one evening, the last one for us, we discerned the sound of approaching merriment, crowds gathering in the narrow streets, distant explosions, loud traditional music echoing up the alleyways and there he was, shaking and weaving his way toward us Saint Bartholomew himself. A twelve foot characature supported by one individual, hugely heavy, followed by, dunno, a female characature, they danced, span, spinned, wove, weaved, all most impressive. 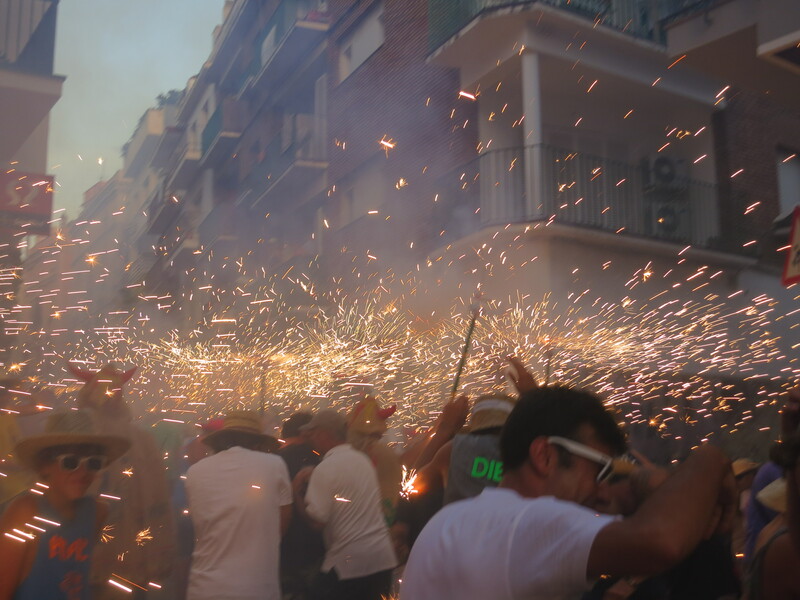 But then…….we were showered with fire, big fireworks, intense in the alleys, sparks on our clothes, in our hair, cowering in doorways as we were bombarded with flying flames, shooting out of passing dragons. My my, health and safety would have had a field day, but this was Spain. The alleys were packed, fifty to a hundred people deep and we were, remarkably, at the front, ducking and diving, avoiding a fiery fate. Small holes began to appear in Sister’s shirt. The noise, intense, loud bangs, kids, masked, warning us to step back, it’s dangerous, I broke my toenail, again, ouch, first busted in Laos on a rock. Just about everyone was wearing a hat, straw, to prevent their hair catching alight, yep, I left mine in the hotel, frantic pawing of head to put the sparks out. Hope you can divine the scene, it was one of those occasions which I think I can describe, without fear of hyperbole, as, “I have never seen anything like it.” I have to admire her, the sister was, I think, bemused. So we survived that and self congratulating made our way back to the hotel for dinner. Ali, our trusty waiter, drove out a squatting drinker from our table and we avoided the ninety minute wait for dinner. Then there was more, a really really spectacular fire works display over the Church. Imagine a pristine bay with a couple of sail boats, maybe the odd pedal boat during the day. Late that night the water was alive with the lights of many many boats, craft, yachts, gin palaces, as far as the eye could see. Where did they all come from, where did they all go….We adjourned to sister’s tiny balcony to enjoy the show, one white wine one red, and excellent it was. An aside here, anyone seen the July Fourth 2012 fireworks display in San Diego ? Half a million people gathered to watch and because of a computer malfunction the whole lot went up in thirty seconds. Oops. It’s on YouTube, of course. Off the next morning to Barcelona with a bit of a bad head, the hi speed train to Madrid, ripped off as we transferred from station A to station B by the cab driver, typical, and another fast ride to Segovia. Before I go I I have to tell you that arriving at Madrid’s Atocha train station is somewhat like docking at an Arthur C Clarke space station, super modern, moving sidewalks, left field sculptures, most impressive. Written at 39,000 feet over Reykjavik, Iceland. 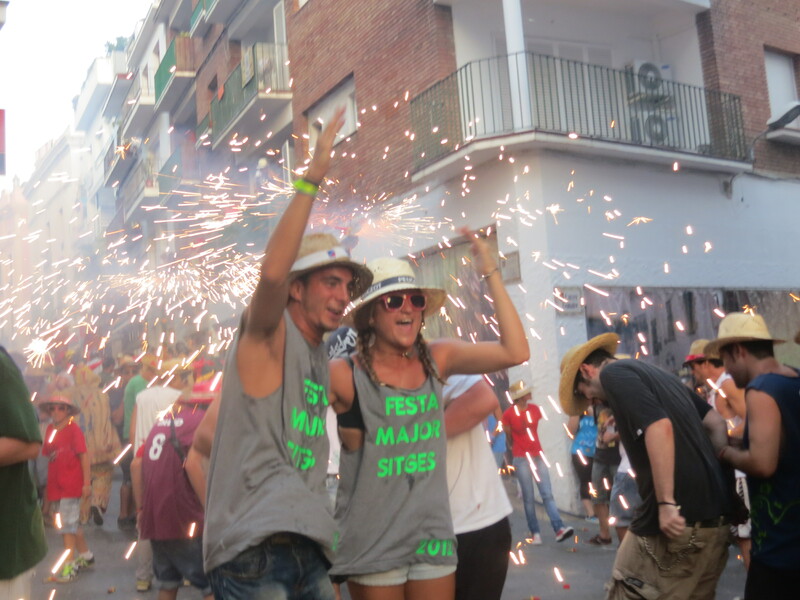 This entry was posted in Spain, Travel and tagged Fiesta, Fireworks, FM12, Sitges. Bookmark the permalink. Seriously amusing, what did St. Bart’s do to warrant such an occasion?? Fortunately, you and your lovely sister survived to share this story with us! She should frame that shirt….as a momento of her bravery! He is paraded around the town four times in twenty four hours and then returns to the church for another year. He is the patron Saint of the town, and, someone said, of the Gay Community but I cannot substantiate that, despite some Googling. What an adventure! You write so vividly! Sounds like you and your sibling had a wonderful time. Glad you escaped a fiery fate!